Paper: Wedemeyer, K. R., George, S., James, H. B., Peterson, T. D., Wicksten, M. K. and Plotkin, P. T. (2015). High frequency of occurrence of anthropogenic debris ingestion by sea turtles in the North Pacific Ocean. Mar. Biol. If you’re a coastal resident, I’m sure you see the same thing as I do when I go to the beach: lots and lots of trash. There’s water bottles and coffee cups and straws and plastic caps and beer cans and plastic bags and who knows what else, both on the sand and along the surf. Hopefully many of you go to pick it up as you walk along like I do, but our individual efforts can’t keep all the plastic from entering the ocean. Where does all the plastic go, once it enters the ocean? There are a number of good posts about mircoplastics (here, one of my previous articles), which are tiny pieces of plastic that end up in the oceans and are ingested by smaller animals. But what about the macroplastics – the water bottles, shards of plastic bags, straws? Those get caught up in ocean currents and eventually make their way to gyres, or large stagnant pools of ocean water surrounded by circular currents (Figure 1). One of those gyres, in the Northern Pacific, has acquired the nickname “The Giant Pacific Garbage Patch”. It covers an area larger than Texas and is in the middle of a lot of sea turtle migration routes. Plastics can be an attractive item for sea turtles – many species eat jellyfish, and a floating plastic bag can look a lot like one of those through a turtle’s eyes. For animals, ingesting plastic can have far-reaching health consequences– the plastic could perforate their stomachs, obstruct their digestive tract, leech toxins into the blood stream, or cause them to “starve” because they’re not eating real food. The researchers in this study wanted to investigate how widespread plastic ingestion is in sea turtles, an acutely endangered group of marine life. Obviously it’s difficult to have sea turtles as experimental specimens – five out of seven species are on the IUCN watch list – so these researchers found a creative way of getting turtles to study. They partnered with open water long-line fishermen in Hawaii and American Samoa, who often catch turtles on their lines because the turtles go for the bait. They collected gut samples from the deceased sea turtles brought up by that long-line fishery for 18 years, giving their dataset a robustness that many studies on sea turtles lack due to the endangered nature of the group. 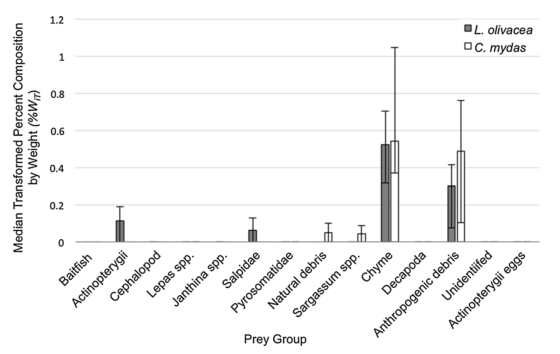 The researchers were able to get enough samples to confidently compare two species, the olive ridley (L. olivacea) and the green sea turtle (C. mydas) (Figure 2). Once they had the gut contents in hand, they took them and sorted them all into categories – anthropogenic debris (plastics), natural debris (feathers, wood), fish, invertebrates, partially digested material (chyme), jellyfish, and algae. Once they had that, they were able to calculate how much (percentage) each category took up in the individual turtle’s stomach contents. Once they had all that data, they were able to calculate each category’s percentage in the species as a whole, and that data is shown in Figure 3. Figure 3 – Gut content by weight. The columns with bars are actinopterygii (bony fish), salpidae (jellyfish), natural debris (wood/feathers), sargassum (algae), chyme (partically digested material), and anthropogenic debris (plastics). As you can clearly see, there was a lot of plastic, but also a lot of partially digested material. Some of you might be thinking – what about the heavier things that the turtle is eating? Won’t that method be biased? You’d be right, and the researchers had another metric to get around that called the frequency percent. The frequency percent is calculated by taking the number of samples of that prey group and dividing that by the total number of samples. That way, their results aren’t thrown off by a particular heavy piece of fish or plastic. As you can see in Figure 4, we have a lot more categories represented now that the data isn’t biased by weight. Figure 4 – Gut content by frequency of occurrence. 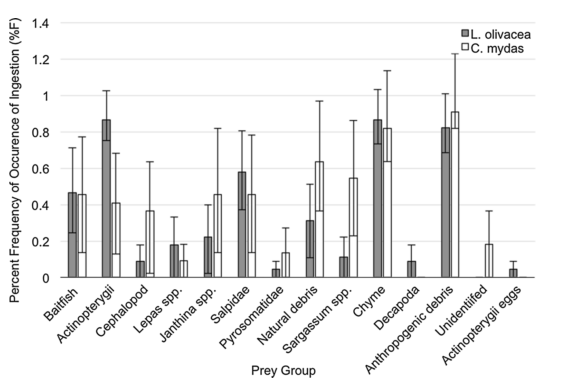 This time, every group is represented, but the important takeaway is that anthropogenic debris (plastics) is present in 82% of olive ridleys and 91% of green sea turtles. That’s a lot of plastic! Clearly, these sea turtles are ingesting a lot of plastics. Figure 5 shows that fact in a more arresting way: the background that these pieces of plastic are laid out on is composed of 8 sheets of computer paper. 8! Figure 5 – Plastics taken from the gut of a green sea turtle. The researchers are careful to note that the sea turtles they used did not die from ingesting plastic; rather, they died due getting hooked in the long-line fishery. However, the amounts of plastics that the researchers found in these turtles was in some cases, more than 48 times the amount calculated to cause digestive tract blockage. What these researchers are seeing are the exceptional turtles – they hypothesize that many more that we don’t know about are dying due to plastics. We’ll need more research into that, but in the meanwhile, we know that plastics are bad for these guys and we know that they’re eating our plastic bags and water bottles and straws. That should be enough of a reason to reduce our usage and reuse what we can! If you have no other reason to recycle, start now: the sea turtles will thank you. Your turn: Do you recycle in your home? What are ways that work well for you? How can you do better?